It has been raining all day in Gettysburg-looks like it might finally clear up- so no battlefield today- instead we hit went to some stores my wife wanted to go to- and since we were going in that direction made a trip to the town of Red Lion, Pennsylvania where I saw there was a record story. Tom’s Record Trade- I spent an hour in there I probably could spend a week. Pluses and minuses to the place- the only minuses was it is cluttered with music- every free space. If I lived in that town I’d go over and organized the place for him- there are boxes of albums everywhere. The higher priced ones are well organized but there are dozens of boxes all over the place with the cheaper records with no order at all. On one hand it is exciting- behind that Wayne Newton album could be something great. The owner was a friendly fella- and as I said thousands upon thousands of albums. The next time I am at Gettysburg [this is our 5th visit this year} I will try and make another trip. I was interested only in the $1 and $2 albums right now- I checked all the ones I bought- all in good shape. I ended up buying 30 albums plus the two re-issues of The Beatles Capital Albums re-issues Vol 1 and Vol.2 for $20 each box a total of eight cd’s. I think I did pretty good for $80. TERRY JACKS: SEASONS IN THE SUN- bought it for my sister- when she was young she’d play that single and cry and of course I’d tease her about it. The Joe Jackson album is excellent, not a duff track. From it I explored Cab Calloway and Louis Jordan. It is a really fun album. I love that album- have it on CD– when I saw it on vinyl i had to grab it! Based on your description, that record store sounds similar to one close to my house – lots of vinyl and mostly unsorted, though I’m not sure you can find records there for just a buck or two. Despite the chaos, I actually love it. Going there is like embarking on some discovery tour! As for the records you got, there is a lot of music there I like. 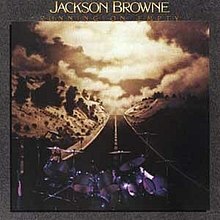 The one I’d like to call to call out in particular is Jackson Browne’a “Running On Empty.” I think it’s his best and one of my favorite ‘70s albums. As a long-time John Mellencamp fan, I also like to acknowledge “Uh-Huh”. The chaos of the store I kind of like- but I wish there had been more room to move- he needs a place twice as large at least! Great record store though and loads of cheap records- everything was reasonably priced. I’ve been in some places where every thing is gold- according to the owner. Yes some real gems on the early Mellencamp records! The Hank Williams sounds great…it’s like looking for lost treasure. It was disappointing when I came across some really great ones- and of course they were scratched up.